We had a simple celebration of our wedding anniversary tonight. But as early as yesterday, my husband gave me fresh flowers. He said it's for his beautiful wife and for being married to him for 5 years. He said it was the best 5 years of his life and that I made him happy. I told him the feeling is mutual, he made me happy too and I had no regrets of marrying him and we embraced and kissed each other. So to celebrate the occasion, I cooked foods like meatloaf, potato salad, pancit, lumpia, blueberry muffins and cathedral windows jello. Wow! I was like a supercook cooking all these by myself. The preparation of the ingredients especially for the pancit took most of my time. 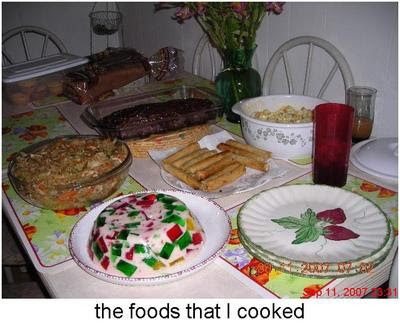 I made the jello last night, the muffins yesterday and I wrapped the lumpia the other day and just fried them today. The pancit, potato salad, meat loaf and the lumpia I cooked them after lunch. Anyway, while I was cooking the pancit, Malou came by and she helped me mixed the pancit and the vegetables together. The noodles were so sticky because my husband bought rice noodles made in Thailand. I asked him to buy me rice noodles which is made in the Philippines and I thought he knows how it looks like but when he came home, he bought a different kind. It tasted good though, only it was sticky. In fairness, the foods I cooked were all good according to my husband. He ate a lot. We didn't even have room for the butter pecan ice cream that he bought. I didn't invite others because I thought I would not be able to cook much. It's good Malou came by, she didn't know that it's our anniversary today. I just asked her yesterday to come today because I'll be cooking. We invited James to come for supper and he came after we ate and Malou had already left. He got off late tonight and he came here straight from work in his navy uniform. We had a good time eating and I gave Malou and James foods to take home. 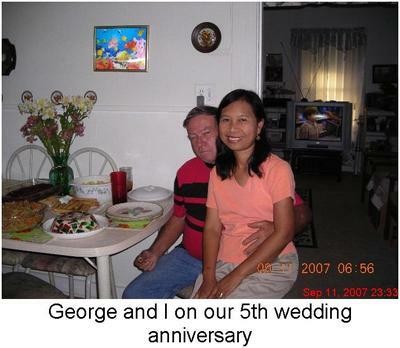 George and I give thanks to the Lord for another wedding anniversary that He gave us. Every good and perfect gift comes from above.